Sediment dynamics in most large river basins are influenced by a variety of different natural and anthropogenic pressures, and disentangling these cumulative effects remains a challenge. This study determined the contemporary and historical sources of fine-grained (< 63-μm) sediment in a large, regulated river basin and linked changes in sources to activities in the basin. The river has seen declines in chinook salmon, sockeye salmon, and the endangered Nechako white sturgeon populations, and sediment (both fine-grained and sands) transport and deposition have been identified as potential causes of these declines. Samples of suspended sediment and potential source materials were collected from numerous sites distributed throughout the upper Nechako River Basin in British Columbia, Canada. A floodplain sediment core was also collected in order to reconstruct sediment sources over the last ~ 70 years. Discriminating fingerprint properties were used within the MixSIAR model to apportion sources among sub-basins and land-use types. Results were compared to records of precipitation and Nechako River discharge trends, and to changes in landscape development. Contributions from the erosion of channel banks dominated the suspended sediment load at most sites. Changes in sediment sources during the 2015 field season reflected snowmelt and patterns of water release from the Nechako Reservoir that affected the sediment-carrying capacity of tributaries and the Nechako River main stem. Spatial variations in 2015 also reflected the distribution of land use (e.g., forested or agricultural land) as well as topography (e.g., slope steepness). Over the last ~ 70 years, variations in sediment sources and the characteristics of the sediment (e.g., organic matter content and particle size composition) were linked to the construction of the Kenney Dam (operational in 1954) and the impacts of deforestation by the forestry and agricultural industries. Superimposed on these have been wildfires and a major mountain pine beetle infestation leading to higher erosion rates in the affected areas. The sediment source fingerprinting technique, in combination with historical information on the hydrometeorology and the land use and river management in the basin, has provided valuable information with which to understand sediment dynamics in the Nechako River Basin. Such an approach can help to disentangle how large river systems respond to a combination of natural and anthropogenic pressures. The online version of this article ( https://doi.org/10.1007/s11368-019-02299-2) contains supplementary material, which is available to authorized users. The Earth’s “critical zone” represents a fragile layer that supports most terrestrial life, and thus is the zone in which most humans live and modify in order to sustain life, especially in terms of forest products, food (i.e., agriculture), and water supply. Hydrologically, the critical zone is composed of drainage basins which route water, chemicals, and sediment from areas of higher elevation to the global ocean. Most large river basins are impacted by cumulative pressures, such as river regulation, land-use change, urbanization, resource extraction, and climate change (Schindler and Smol 2006; Vörösmarty et al. 2010). Such pressures express themselves in several ways, some of which can be measured, such as changes in water quantity and quality, and changes in ecological functioning. In reality, disentangling these cumulative effects is complicated because of temporal and spatial variations in how these individual effects operate, the potential for synergistic interactions, and issues of disconnectivity in landscapes, and because there are time lags between the start of an effect and the (measured) response (e.g., Smith and Owens 2014a; Wohl et al. 2019). The end result is that scientists and managers are often not capable of disentangling cumulative effects in large, complex river basins. The Nechako River Basin (NRB) is typical of many large river basins in Canada, and elsewhere, in that it has experienced considerable changes in the last few decades or so in response to cumulative effects. The most dramatic of these in terms of river flows and aquatic species was the construction of the Kenney Dam in the early 1950s and the creation of a 920-km2 reservoir; the purpose being to redirect water westwards against the hydraulic gradient to power an aluminum smelter near the British Columbia coast. The Nechako is now a regulated river. Since the construction of the dam and reservoir, there has been concern from communities in the river basin over the amount and timing of river flows, including periods of low flows and also downstream flooding associated with reservoir operations (Hartman 1996; French and Chambers 1997; Albers et al. 2016). There is also concern for aquatic organisms in the river, especially the Nechako white sturgeon (Acipenser transmontanus), which started to decline dramatically in the 1960s, and is now listed as an endangered species (McAdam et al. 2005). The river also provides important spawning habitat for anadromous chinook salmon (Oncorhynchus tshawytscha) and sockeye salmon (O. nerka). There have also been land-use changes such as an expansion of agriculture and forest harvesting, and associated road networks, as well as resource extraction (e.g., mining) over this period (Hartman 1996). In addition to anthropogenic pressures, the river basin has: experienced changes in temperature and precipitation associated with global climate change (Danard and Murty 1994; Déry et al. 2012; Kang et al. 2016); recent episodes of severe wildfires; and a catastrophic outbreak of mountain pine beetle (Dendroctonus ponderosae), which started in the early 1990s and subsequently spread to large parts of North America (NRC 2018). These outbreaks have significantly diminished lodgepole pine (Pinus contorta) tree populations which, in turn, have likely contributed to soil instability and erosion. One of the manifestations of these changes has been the amount and quality (e.g., texture, concentrations of nutrients and contaminants) of sediment transported and stored within the river channel system (e.g., Owens et al. 2019). Indeed, increased storage of sediment—both fine-grained (silt and clays; < 63 μm) and sands (> 63 μm to 2 mm)—in river channel gravels has been identified as a possible reason for the decline in the Nechako white sturgeon population (McAdam et al. 2005), as well as chinook and sockeye salmon stocks (Jaremoviec and Rowland 1988) that spawn in tributary systems to the Nechako River. There has, therefore, been considerable interest in identifying where the sediment originates and what might be the cause of any change in the amount and nature of the sediment fluxes. The sediment fingerprinting technique (Walling 2013; Owens et al. 2016; Collins et al. 2017) offers the potential to address some of these issues, especially as it can be used to reconstruct changes in sediment sources and dynamics in river basins over timescales of decades to hundreds of years (e.g., Collins et al. 1997; Owens and Walling 2002; Walling et al. 2003; D’Haen et al. 2012). In this context, the objectives of this study were to: (i) identify the contemporary sources of fine-grained sediment transported in the middle to upper reaches of the Nechako River; (ii) reconstruct the main sediment sources since the construction of the Kenney Dam and Nechako Reservoir; and (iii) assess any changes in sediment sources in the context of cumulative effects. The NRB is located in central British Columbia (Fig. 1). It drains 47,200 km2 (~ 5% of mainland British Columbia) and it is the Fraser River’s second largest tributary. It joins the Fraser River at the city of Prince George (~ 74,000 people). The Fraser River Basin (234,000 km2) drains about 25% of British Columbia and discharges to the Pacific Ocean at Vancouver. Surficial geology in the NRB is dominated by Tertiary volcanic and volcanoclastic rocks and Quaternary glacial deposits which are underlain by Jurassic to Cretaceous sedimentary strata and Mesozoic igneous rock (Calvert and Andrews 2014). Parent soil materials in the NRB are mostly comprised of gray basal or colluviated sandy tills; surficial humus layers are typically thin (2–4 cm) with predominantly brunisols beneath (Cook and Dunn 2006). The area is dominated by pine and spruce forests (Dorcey and Griggs 1991). The study area was limited to the NRB located upstream of the community of Vanderhoof (Fig. 1) where the sturgeon recruitment failure has been the most drastic, and where there are important spawning areas, thus delimiting a watershed of 25,200 km2. In this part of the river basin, the most urbanized areas are Vanderhoof (pop., ~ 4440 inhabitants) and Fort Fraser (pop., ~ 500 inhabitants), with the rest of the population living in sparse settlements. Forestry has historically been the main anthropogenic activity in the NRB but over the past 20 years, mountain pine beetle infestations have had a severe impact on the tree cover. Frequent forest fires occur in the NRB; the most significant recent events prior to 2015 occurred in 2010 in the Cheslatta Lake area (2916 km2 burned) and near Cut Off Creek in 2004 (104 km2 burned). Also, large areas of forest have been cleared for agricultural activity (Nener and Wernick 2000; Picketts et al. 2017). As described above, the main anthropogenic impact on water and sediment dynamics within the Nechako River is the Kenney Dam, which was built in the early 1950s, and the subsequent water management policies. Mean annual air temperature in the basin is 3.7 °C and mean annual total precipitation is 601 mm of which about one third falls as snow (Benke and Cushing 2005; Albers et al. 2016). Peak river discharges at Vanderhoof (up to ~ 600 m3 s−1) occur during the snowmelt period, which typically occurs in late May or early June, although flows can be high after this period due to releases from the reservoir (Albers et al. 2016). The annual average discharge at Vanderhoof (Water Survey of Canada hydrometric station 08JC001) was 3.3 × 109 m3 year−1 (1981–2015). To investigate the fine-sediment sources and dynamics within the river basin, soil, channel bank, and suspended sediment samples were collected throughout the basin, along with a sediment core near Vanderhoof (Fig. 1). To limit the spatial extent of the study area given the large size of the basin, the four major lakes/reservoirs in the study area were assumed to act as sediment sinks, supplying limited amounts of sediment to the downstream Nechako River. Such an assumption is supported by previous studies showing that limited amounts of sediment were transported downstream of the outlet of lakes with long residence times (Kemp et al. 1978; Colman and Foster 1994). The water from the Nechako Reservoir is delivered to the Nechako River through the Skins Lake spillway and via Cheslatta Falls upstream of the confluence with Cut Off Creek (site N@CO, Fig. 1); water is not released via the Kenney Dam. Six suspended sediment sampling sites were selected along the Nechako River main stem (Table 1). Two of the sites were located just upstream (N@TB) and downstream (N@DO) of the Nautley River inflow in order to determine any change in the geochemical signature of suspended sediment due to inputs from the Fraser Lake sub-basin (Fig. 1). Six of the main tributaries of the Nechako River were also sampled to cover a range of land uses (Table 1, Fig. 1) from primarily forested (e.g., GREE, TARG) to those with moderate (e.g., SMIT) or large areas cleared for agriculture (e.g., CLEA, STON, MURR). The selected sub-basins also displayed a large range of physiographic conditions from high and steep sub-basins in the uppermost part of the NRB to flatter, lowland sub-basins near Vanderhoof (Fig. 1). Sub-basin areas and boundaries were determined with ArcMap 10.5 with the ArcHydroTool extension. Mean elevations and terrain slopes were determined from a provincial digital elevation model, and land-use patterns were determined using the Vegetation Resource Inventory (Agriculture and Agri-Food Canada 2017; BCFLNRORD 2018a, b). Suspended sediment was collected at all sites over the period March to November 2015. Sampling frequency changed from bi-weekly collection in spring and summer (high-flow periods) to monthly collection during autumn (low-flow period). Suspended sediment samples (N = 175) were collected with time-integrating sediment samplers: see Phillips et al. (2000) and Smith and Owens (2014b) for details on design and operation. The samplers were placed approximately 30 cm above the river bed and tied to the shore. At the tributary sites, samplers were placed far enough upstream from the main stem to prevent back flooding. Suspended sediment from the traps was collected and placed into clean plastic buckets, left to settle for 48 h, decanted, oven-dried at 105 °C for 24 h, and stored for further processing. In September 2014, a sediment core was collected from an island within the main stem of the Nechako River, at Vanderhoof (between sites N@VA and STON, Fig. 1), that undergoes annual flooding. The core tube (1-m long, 10-cm internal diameter) was manually inserted into the fine overbank sediments and removed with a spade. The sediment core was frozen for subsequent processing. The 81-cm-long sediment core was sliced in 1-cm layers. Each layer was dried at 105 °C in an oven for 24 h and sieved at 63 μm to determine the fine-sediment mass before being processed further. Soil sampling sites were selected across the investigated area to cover the range of land uses: (i) native forest, (ii) burned forest, (iii) logged forest, (iv) cropland, (v) straw (i.e., hay) fields, and (vi) grasslands and pasture. Composite samples were collected using a stainless steel hand corer. At each site, topsoil (upper 10 cm of soil) and subsoil (> 15-cm depth) samples were collected separately to investigate potential changes in geochemical signature with depth. Soil samples (N = 78) were collected during June and July 2015. Channel bank samples were collected along the Nechako River main stem from three main areas undergoing active bank erosion: 10-km and 6-km lengths of cut banks (also called river cliffs; bank heights up to ~ 10 m) located upstream and downstream of the N@GR sampling site, respectively, and 10 km of active floodplain erosion (bank heights 1–3 m) located upstream of the N@27 sampling site (Fig. 1). Tributary bank samples were also collected at locations close to suspended sediment and soil sampling sites. At each site, five bank samples were collected using a stainless steel corer inserted horizontally into the banks from 0 to 2 m above high-water level and they were combined into a composite sample, so as to get a representative sample. Altogether, 39 river bank samples were collected during July and August 2015. Both soil and bank samples were dried and sieved at 63 μm. Suspended and floodplain sediment, soil, and channel bank samples were analyzed to quantify their geochemical signature (total labile metals/metalloids) using inductively coupled plasma–mass spectrometry (ICP-MS; Agilent Technologies 7500cx Series) at the University of Northern British Columbia’s (UNBC) Northern Analytical Laboratory Services (NALS) facility. Approximately 150 mg of material was weighed into glass tubes with metal-grade acids (3 mL 15.6 M HNO3 + 1.5 mL 12.1 M HCl; both BDH Aristar Plus). The digestion sequence consisted of a pre-digestion at room temperature for 20 min with periodic shaking, then a microwave-assisted digestion at 180 °C under 50-bar pressure. Final digestates were diluted with Type-2 water to 15 mL and stored at 4 °C until analysis by ICP-MS. Quality control was undertaken by running a duplicate split, a 100-ppb multi-element standard, a method blank, and a certified reference material (either National Research Council HISS-1 [Hibernia Shelf, Newfoundland] or PACS-2 [Esquimalt Harbour, British Columbia]) every 11 samples. For detailed analytical procedures, see Owens et al. (2019). To date the floodplain sediment core, cesium-137 (137Cs; half-life 30.2 years) and excess lead-210 (210PbXS; half-life 22.3 years) were measured. Cesium-137 is an artificial radionuclide that was released into the atmosphere and was deposited through wet and dry fallouts onto surface soils and sediments after thermonuclear bomb tests conducted in the 1950s and 1960s. It was also released into the atmosphere after nuclear power plant accidents (i.e., Chernobyl in 1986, Fukushima-Dai-ichi in 2011), although radioactive fallout due to these accidents is generally negligible in most parts of Canada compared to bomb-derived fallout (Joshi 1986, 1988; Smith et al. 1993). Lead-210 is supplied to soils through the decay of both geogenic 238U and atmospheric 222Rn. The atmospheric source supplies additional activity (i.e., 210PbXS) through rainfall. Both radionuclides quickly sorb onto, and remain tightly bound on, soil and sediment particles (Mabit et al. 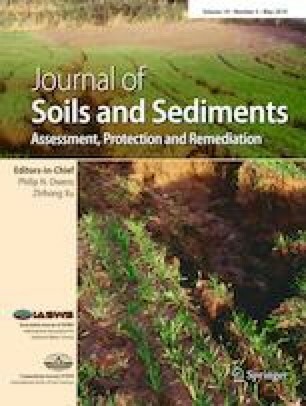 2014) providing a means to reconstruct the history of sediment deposition at sites that undergo regular sedimentation (Mabit et al. 2014). Thus, the layer in the sediment core with the maximum value of 137Cs activity matches the time of maximum atmospheric fallout in 1963, while 210PbXS allows the quantification of sediment deposition rates over ~ 100 years (i.e., five half-lives). Samples were packed into 4-mL pre-weighed polyethylene containers and sealed airtight for 21 days (for details, see Mabit et al. 2014). The 137Cs and 210PbXS activities in the samples were determined by gamma spectrometry using very-low-background HPGe detectors in the Department of Soil Science at the University of Manitoba, Winnipeg, Canada. The 210PbXS activity concentrations were estimated as the difference between the total 210Pb and 226Ra activities and the Constant Rate of Supply (CRS) method was used to establish the core chronology (Appleby and Oldfield 1992). The sediment layers in the floodplain core were also analyzed for organic matter content (by loss-on-ignition) and particle size distribution using a Malvern Mastersizer 3000 laser diffraction analyzer, at NALS, after the removal of organic matter by hydrogen peroxide, and chemical and ultrasonic dispersion. All statistical tests and the mixing model runs were undertaken using R software (v. 3.4.4; R Core Team 2016) with the Rstudio interface (v. 1.1.453). Differences in tracer distribution were assessed using the Kruskal-Wallis H test: kruskal.test in R. To evaluate the differences between the source geochemical signatures, discriminant function analysis (DFA) was carried out using the ade4 package and the significance was tested using multivariate analyses of variance (MANOVA): manova function in the MASS package. Relations between parameters were assessed using the Spearman method of the function cor.test in R.
The mixing models were created using the MixSIAR function (v. 3.1.9) from the MixSIAR R package (Stock and Semmens 2016a). MixSIAR is a Bayesian mixing model framework that was originally designed to estimate the proportion of prey sources ingested by a predator based on biological tracer data; for a detailed description, see Parnell et al. (2013). 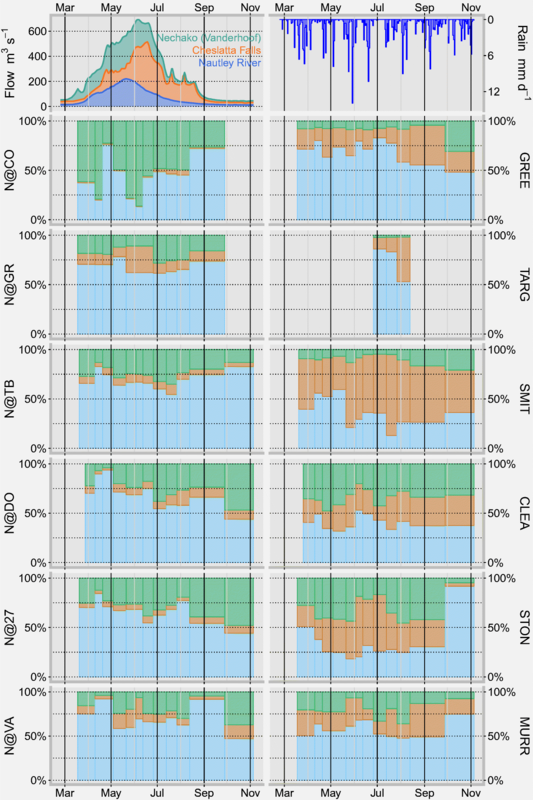 The effectiveness of Bayesian sediment fingerprinting models to estimate the proportion of sediment sources based on geochemical signatures has been demonstrated in several previous studies (e.g., Koiter et al. 2013a; Cooper and Krueger 2017; Blake et al. 2018; Liu et al. 2018) and they have been evaluated positively by Davies et al. (2018). The probabilistic Bayesian hierarchical model with Markov Chain Monte Carlo (MCMC) sampling was run using the JAGS software (Just Another Gibbs Sampler; v. 4.3.0; Plummer 2003) interfaced with the R software. An uninformative prior was used assuming that the proportions of each source were the same (Ward et al. 2010). The distribution for the sediment data was not known as only one suspended sediment sample was collected per site and per sampling date; consequently, the error structure in MixSIAR was set to “process only,” therefore assuming a fixed variance based on the variance of the source (Stock and Semmens 2016b). Geochemical elements for which contents were below the limit of quantification (LOQ) for 10% of the samples from at least one sample type (i.e., suspended sediment, sediment core, forests, agricultural lands, channel banks) were deemed to be unreliable as potential tracers. For the remaining elements (i.e., B, Na, Mg, Al, P, Ca, V, Cr, Mn, Fe, Co, Cu, Zn, Ga, Ge, Rb, Sr, Ba, La, Ce, Pr, Nd, Sm, Eu, Gd, Dy, Er, Ub, Pb, Th, U), concentrations < LOQ were replaced by LOQ/√2. Tracers were selected using Kruskal-Wallis comparisons and range tests to ensure significant differences between the sources, and that sediment tracer values were within the ranges observed for the sources. Discrimination factors were set to zero under the assumption that no enrichment occurred during erosion and sediment transport. All mixing models were run for 1,000,000 iterations with a 500,000 sample burn-in and a jump length of 500 to minimize autocorrelation between runs. Model convergences were tested using the Gelman-Rubin and Geweke diagnostics (Gelman and Rubin 1992; Geweke 1992; Brooks and Gelman 1997). Fingerprint property concentrations were not corrected for organic carbon content nor for particle size differences as previous studies concluded that the use of untested correction factors may lead to unreliable or erroneous results (Koiter et al. 2013a, 2018; Smith and Blake 2014; Laceby et al. 2017). Moreover, no statistical difference in carbon content and particle size was observed between suspended sediment and source samples (Mann-Whitney test: p value > 0.7). Uncertainties in source apportionment results were provided by MixSIAR and are standard deviations (see Electronic Supplementary Material). Temporal changes in sediment sources for the Nechako River main stem and tributary sampling sites for the 2015 season were compared to water discharge measured in the Nechako River at the main inlets (Cheslatta Falls and Nautley River) and at the outlet (Vanderhoof) of the study area. The discharges were measured at the Water Survey of Canada hydrometric gauging stations 08JA017, 08JB003, and 08JC001. The investigation on the influence of the variations in Nechako River discharge on the sediment sources at Vanderhoof since the 1950s was also based on the Water Survey of Canada archived hydrometric data at gauging station 08JC001. In order to investigate the influence of rainfall events, changes in source contributions were compared to the average rainfall amounts over the study area. These were estimated as the mean value of the rainfall measured at five Environment and Climate Change Canada weather stations at Vanderhoof, Burns Lake, Fort St. James, Ootsa/Skins Lake, and Prince George (climate station IDs: 1098D90, 1091174, 1092970, 1085836, and 1096439, respectively). Discriminant Function Analysis was used to examine the differentiation between the three (revised) source groups (Fig. 2b). Although the selection of suitable tracers by DFA is not required to use MixSIAR, this method highlights the differences between the three source groups that were found to be significantly different (MANOVA: p < 0.001). To select the best set of tracers, all parameters underwent “range tests” (e.g., Laceby et al. 2017) to compare tracer contents in the sediment (core and suspended sediment) samples with those for the source samples (i.e., agricultural lands, forests, and channel banks). Although phosphorus (P) passed the range test, this element was not kept because it has been previously reported to be a non-conservative fingerprint property in many situations, especially in depositional areas (Owens et al. 1999; Koiter et al. 2013b). Potential tracers were also tested for significant differences (Kruskal-Wallis test: p < 0.01) that would permit sediment sources to be apportioned between land uses and also sub-basins. Consequently, 15 tracers were selected to run the mixing model: Al, Ba, Ca, Ce, Dy, Er, Gd, La, Nd, Pb, Pr, Sm, Sr, Yb, and U (Fig. 3). 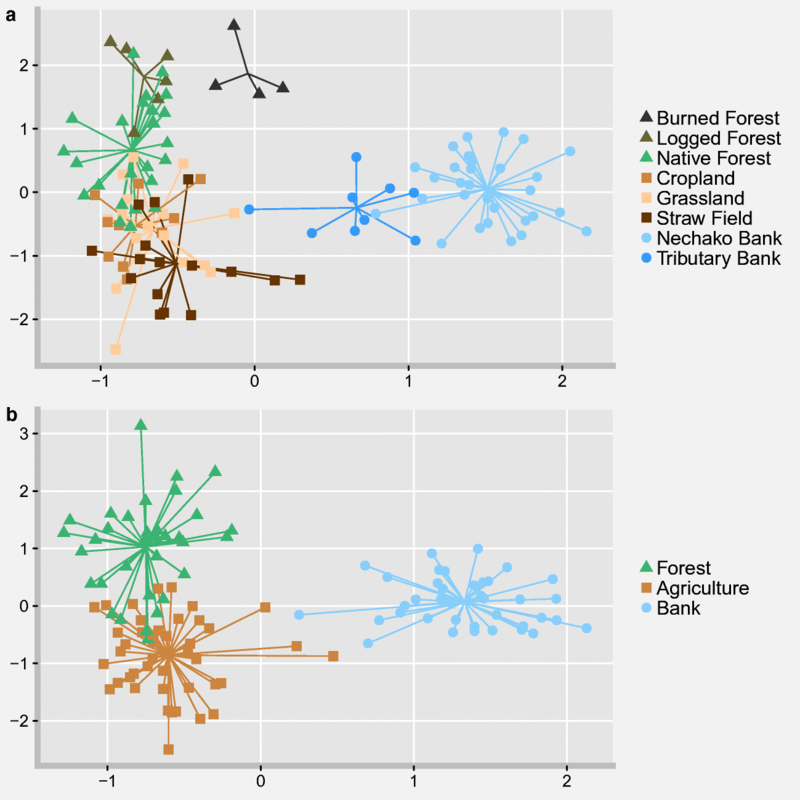 Among the fingerprint properties, 13 displayed significant variations between channel banks and agricultural lands, 12 differentiated between channel banks and forests, and 10 showed contrasting values between agricultural and forested lands. For Ba and heavier elements, the maximum contents were systematically measured in channel bank samples, while the highest contents for Al, Ca, and Sr were measured in forests. For all other elements, the lowest concentrations were measured in forest samples. There were no differences in the property concentrations between topsoils and subsoils in agricultural areas (Mann-Whitney test: p > 0.05), probably due to the plowing process. However, for forested areas, among the 15 selected fingerprint properties, ~ 50% (Ca, Ce, Dy, Gd, Nd, Pr, Sm, and Sr) showed contrasting concentrations between the surface and the subsoil horizons. These changes were mainly due to the frequent presence of very low values in topsoil, while the property concentrations appeared to be more homogeneous in subsoil horizons. For both agricultural and forested areas, topsoil and subsoil samples were combined as a single source type for each land use. The 15 fingerprint properties were used within the MixSIAR mixing models. All models passed the Gelman-Rubin convergence test as all the potential scale reduction factor (PSRF) values were < 1.05, thereby demonstrating that the Markov chains were long enough. As the sediment fluxes at each sampling site were not available, the following changes are only relative and must be used with caution. More detailed information on the uncertainties for all sampling sites can be found in the Electronic Supplementary Material. During the entire 2015 sampling period, channel banks were found to be the dominant sediment source for all the main stem sampling sites and most of the tributary streams (Fig. 4). However, several contrasting trends were observed depending on the location of the site along the Nechako River or within the river basin. This site exhibited considerable variability which can be explained by its upstream location. Until June, forested areas were found to be the main source of sediment except for two sampling periods at the end of April and in early May when an increase in supply from channel banks was observed. This drastic change coincided with a sharp rise in river discharge (from 138 to 270 m3 s−1) that resulted from water releases at the Skins Lake spillway. From late June to mid-August, channel banks and forested areas supplied similar proportions of sediment, while agricultural lands had a very limited influence. This high value of the contribution from forest soils, which are usually reported as less erodible (Morgan 2005; Nearing et al. 2005; Borrelli et al. 2017), might be explained by the large portion of burned forests since large fires in 2010 destroyed 2916 km2 of forest north of Cheslatta Falls and Skins Lake. The storage of sediment eroded from burned forest soils in the Cheslatta system could also explain the peak of sediment from forest sources measured at N@CO during the flood peak in late May and early June as this material could be remobilized by the large flows of water (515 m3 s−1) released from the reservoir into the Nechako River through Cheslatta Lake. The noticeable increase in forest sources in late May and early June may also reflect a moderate rainfall event (> 14 mm day−1) at this time. From mid-August to October, channel banks were the main contributors to the suspended sediment load at this site. However, during this period, water flows in the Nechako River had dropped to ~ 30 m3 s−1, suggesting that limited amounts of sediment were eroded from the channel banks and that this change in sediment origin might instead be due to the lack of surface erosion of forested or agricultural soils, as only a few days had rainfall totals > 5 mm day−1. Similar patterns were observed for these two sampling sites. Over the sampling period, the changes in sediment sources were less significant than those recorded at N@CO. The geochemical signature of suspended sediment remained relatively constant from March to July, except for a few changes. For both sites, a slight increase in channel bank contribution was observed between late April and early May. This period matched the rapid rise in water level due to water releases from the reservoir, suggesting that a rapid change in water depth might lead to bank instability and erosion (Julian and Torres 2006; Chen et al. 2017). During late May and June, a rise in sediment supply from agricultural areas was observed, although only at N@GR, which might reflect the greater rainfall amounts during this time. The difference between sites cannot be explained by the differences in land use between the two sub-basins and it might be due to localized land management practices as agricultural contributions were higher at N@GR during the whole sampling period. For both sites, there was an increase in contributions from forest soils from March to July followed by a decrease until the end of the sampling period. This seasonal change in the sediment supply from forested areas could be related to the progressive change in the freshet from lowland agricultural areas to elevated forest areas that lasted until late July. Thus, the difference in mean elevation between both watersheds (Table 1) could explain why this phenomenon was observed until August in the upstream watershed. At the end of the sampling period (September to November), as with the N@CO site, there was a rise in the relative contributions from channel banks, likely due to similar reasons. Similar patterns were observed for the three downstream sites on the Nechako River main stem. Channel banks were found to be the main source of sediment even though their relative supply to the sediment load generally decreased over the sampling period. The temporal changes in sediment source at N@DO were different from those observed at N@TB, therefore suggesting that sediment derived from the Fraser Lake sub-basin through the Nautley River had a significant impact on the composition of sediment carried in the downstream reaches of the Nechako River. Slight increases in channel bank contributions were observed during the period of rapid changes in river flow (late April and August). However, the changes in channel bank contributions were not synchronous for all the Nechako sampling sites suggesting that the various bank areas might have been undergoing active bank erosion at different times. Among the Nechako River main stem sampling sites, the most noticeable bank supply was observed at N@VA in August and September. Except for this, all three downstream Nechako sites displayed a continuous rise in contributions from forest sources that could be related to the progressive effect of the freshet on forested areas in the more remote, and higher, parts of the basin and/or the decline in the relative contributions from channel banks due to decreasing river flows in the latter part of the sampling period. For the proportion of sediment coming from agricultural areas at Vanderhoof, it was higher during May to early June, reflecting the freshet in the lower parts of the basin and the higher rainfall amounts, and in October. These two sub-basins have the smallest amount of cleared land (Table 1). High contributions due to channel bank erosion were measured during the period from March to late July which matches the freshet. This suggests that the rise in water level and the subsequent bank erosion led to a greater supply of material than from surface soil erosion by water released by snowmelt. During late July, there was a sharp rise in sediment contributions from agricultural areas at both sampling sites, which could reflect land management practices as well as a rainfall event of ~ 10 mm day−1 during the time that the sampler was deployed. At the GREE site, a rise in the relative proportion of sediment originating from forests was observed in October that might be due to a reduction of sediment supply from channel banks and agricultural areas. The four downstream sub-basins have similar, lower elevations (~ 800 m a.s.l.) and greater amounts of cleared land for agriculture and other land uses compared to the previous two sub-basins (Table 1). At the SMIT site, a continuous rise in contributions from forest sources was observed but the main contributor remained the agricultural lands, which reached its maximum between late May and late July. The proportion of sediment that originated from channel banks was higher at the beginning of the sampling period with a peak in May, then it decreased during the summer and started to increase during the autumn. This relative increase of channel banks may be due to lower supplies of sediment from forested and agricultural lands or may reflect autumnal rain events. At the CLEA and STON sites, similar source contributions were determined at the start of the sampling period with channel banks accounting for ~ 40% of the sediment load while the proportions of forested and agricultural areas were about the same (~ 30%). This result is consistent with the similarity of morphology and land uses (Table 1) in the two sub-basins. At the CLEA site, the proportion of each source was broadly similar over the sampling period. In June, the relative contributions from forests decreased without an obvious reason, whereas the rise in channel bank and agriculture land coincides with the freshet and the subsequent rise in water level. At the STON site, the temporal trend was very similar to that observed at the SMIT site. A larger contribution from channel banks was measured in March at the start of the freshet when river flows increased while the presence of a dense snowpack prevented surface soils from being eroded (Fu et al. 2010). Sediment contributions from surface soils started to increase in April and reached a peak in mid-summer when more than half the sediment was coming from agricultural lands, leading to a concomitant decrease in the relative contribution of channel bank material. The value of channel bank contributions during the last sampling period was unusually high (> 90%) and may be due to recent bridge building across the river approximately 2 km upstream of the sampling site. Remobilization of channel bed and bank material due to the construction could explain the rise in channel bank contributions. At the MURR sampling site, the overall contribution of river banks to the sediment load was higher than that at comparable sampling sites (CLEA and STON). This difference may be due to local channel bank erosion near the sampler. The estimation of the source contributions integrated over the sampling period provides a means to investigate spatial trends over the study area and to compare results for the Nechako River main stem with its main tributaries. As no data were available to quantify the sediment fluxes at the suspended sediment sampling sites, the average source contributions were estimated using the contributions quantified above weighted according to the sampling duration (Fig. 5). Thus, the time-averaged contributions must be interpreted as a frequency of sediment supply rather than the actual contributions to the sediment flux. However, temporal changes in sediment origin at each site were generally limited, therefore suggesting that weighted-average contributions would be similar. However, caution should be exercised when interpreting these results. In the case of the sites along the Nechako River main stem, the geochemical signature of the suspended sediment samples were similar except for the most upstream site (N@CO; Fig. 5). Thus, suspended sediment mainly originated from channel banks (60–70%) with smaller amounts coming from forested areas (20–30%) and agricultural lands (10–15%). Regarding the contributions from channel banks, it was slightly higher at sampling sites located downstream of the active bank erosion areas (i.e., N@TB and N@VA) which were visually identified during the sampling campaign. 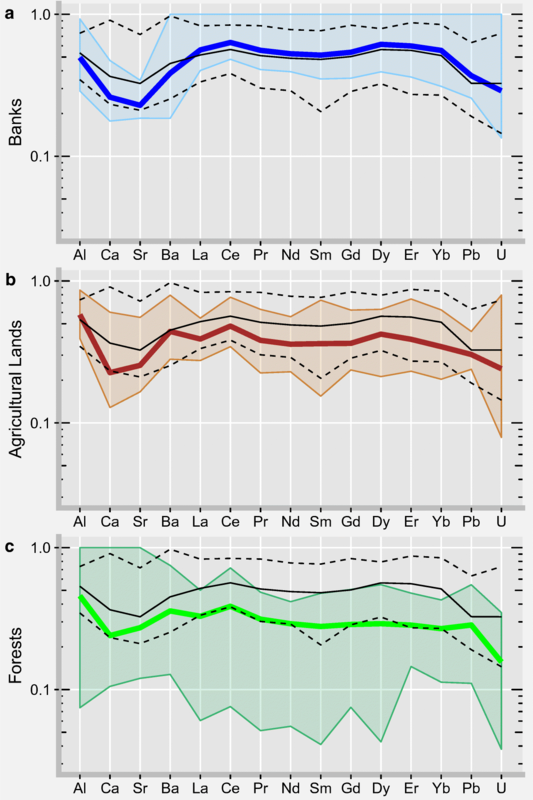 The proportion of sediment from agricultural lands was surprisingly high at N@GR considering the limited surface area of this land use in the sub-basin (Table 1). However, it was consistent with the abundance of sediment from agricultural soils determined for Greer Creek (i.e., the GREE site). It is important to note that the N@GR site was located downstream of the confluence of Greer Creek with the Nechako River and on the same bank. Consequently, heterogeneous mixing of sediment at the confluence might have led to an overrepresentation of sediment coming from Greer Creek. For N@DO and other downstream sites, the proportion of sediment coming from forested and agricultural areas increased with the relative surface area exploited for forestry and agriculture. This change might also be due to sediment supply from the Fraser Lake sub-basin through the Nautley River. Indeed, different sediment composition was observed at the sampling sites located upstream (site N@TB) and downstream (site N@DO) of the confluence of the Nautley and Nechako Rivers. At the downstream site on the Nechako River main stem, there was an increase in contributions from channel bank sources compared to sites immediately upstream. This rise might be because the community of Vanderhoof is located downstream of an area of intense floodplain erosion, or it may reflect a one-time event as the mean value included a noticeably high value observed for the sample collected in late September, which encompassed the sampling period from mid-August to end of September (Fig. 4). This highlights the limits of using time-averaged values instead of values weighted by the actual sediment fluxes. Among all main stem sites, the sediment collected from the N@CO site, which is located 13 km downstream of Cheslatta Falls (Fig. 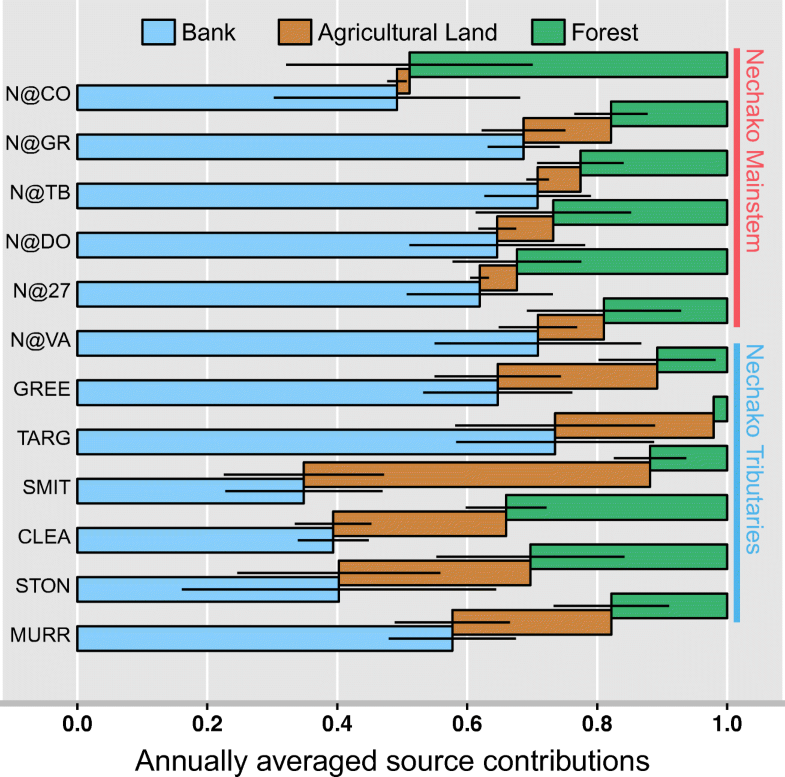 1), had the most contrasting sources with similar contributions from channel banks and forests and minimal contributions from agricultural areas (Fig. 5). The strong relationship between water discharge at the Skins Lake spillway and sediment originating from forested areas (Fig. 4) suggests that remobilization of material stored on the bottom of Cheslatta Lake might be the main process driving sediment composition. Indeed, significant areas of the sub-basin contributing to the Nechako Reservoir were burned during a large wildfire in 2010, potentially leading to a great supply of sediment from forest sources to the reservoir. The other source of sediment was the channel banks reflecting the importance of flow during the freshet and reservoir releases. The lack of sediment derived from agricultural lands was expected as they only cover a negligible surface area in the N@CO sub-basin (Table 1). In terms of the average source contributions at the tributary sampling sites (Fig. 5), three groups could be distinguished based on their location. At the upstream sites (GREE and TARG), large contributions of channel banks (65–70%) and agricultural lands (~ 25%) were observed but supplies from forested areas were surprisingly low (~ 5–10%). However, unlike downstream sub-basins, only a small portion of forests have been harvested and native forests have low erosion rates due to the dense vegetation cover (Morgan 2005; Nearing et al. 2005; Borrelli et al. 2017). Moreover, because of this vegetation cover, the freshet led to increased channel bank erosion rather than surface soil erosion. The amount of sediment originating from agricultural areas was significant in regard to the limited areas exploited for agriculture but the relatively steep slopes in these sub-basins might have led to higher erosion rates. This supply had a noticeable effect on the composition of sediment in the Nechako River downstream of Greer Creek (i.e., at N@GR). The SMIT sampling site drained a sub-basin characterized by a larger amount of cleared land compared to CREE and TARG (i.e., similar to the more agricultural downstream sub-basins) but with a steeper relief, similar to these two upstream tributary sites. Among all sites, the highest agricultural contribution was measured at the SMIT site suggesting that cropland erosion rates and sediment delivery strongly depend on the slope of the land. Within the three downstream sub-basins, large portions of lands have been cleared for forest harvesting and agricultural activities (Table 1) leading to significant erosion of surface soils with contributions of ~ 40–60%, mainly related to the timing of snowmelt. The similarity of contributions from forested and agricultural lands might be explained by forestry activities (including salvage logging) following the mountain pine beetle outbreak, which started in the 1990s and persisted for several decades (NRC 2018) that made the soil more susceptible to erosion. At the MURR site, the high channel bank proportion (~ 60%) compared to CLEA and STON (~ 40%) might be due to local erosion processes as the agricultural lands are located in the uppermost part of this sub-basin and because eroding channel banks were observed immediately upstream of the sampling site. A chronological framework of the sediment core layers was established based on short-lived fallout radionuclide activities (Fig. 6a, b). The plot of 137Cs activity displayed two peaks at depths of 12 ± 1 cm and 31 ± 1 cm (Fig. 6a), which is common in many sediment cores collected in floodplains with regular overbank sediment supply in the Northern Hemisphere. The deepest peak correlates with the maximum of atmospheric fallout related to nuclear bomb tests (i.e., 1963; Abril 2004). The upper peak could be related to the Chernobyl nuclear plant accident in 1986 (Davison et al. 1993), although generally its occurrence in North America is believed to be minimal (Smith et al. 1993). The logarithmic plot of 210Pbxs versus depth (data not shown) displayed a general decrease, as expected, and led to an estimation of an average sedimentation rate of 6.2 mm year−1 for the period since the early 1970s, which compares favorably with the 137Cs-based estimates detailed below. The fallout radionuclide activities did not provide useful information for the bottom part of the core as it was comprised of very heterogeneous sediment. In particular, a thick layer of coarse sediment was found between 38- and 69-cm depths. Due to its approximate date (early 1950s) and the coarse nature of the sediment at this depth, this layer was assumed to be related to the single reservoir filling event during which the Nechako River discharge at Vanderhoof dropped to 60 ± 23 m3 s−1 for four successive years between 1953 and 1956: prior to this, winter flows were typically between 50 and 150 m3 s−1 and peaks during the freshet were of the order of 500 m3 s−1 (Hartman 1996). Because of the lack of accurate data to date the deepest part of the core, no attempt was made to match these layers to a specific year. This part of the core will be referred to as the pre-dam period. Overall, four periods were distinguished within the core. The layers between 81 and 70 cm constituted the pre-dam period. Because it was not possible to date these layers, the sedimentation rate could not be estimated. During this period, the average organic matter content was 3.0 ± 0.44% and the fine-sediment fraction (< 63 μm) accounted for 24 ± 12% of the total mass of sediment. The main source of the < 63 μm fraction (i.e., not the bulk sediment) was determined to be the channel banks (72 ± 6%), followed by forests (23 ± 6%) and agricultural areas (5 ± 1.4%). The layers between 69 and 38 cm constituted the reservoir filling period characterized by a sharp decrease in water discharge. At this time, the deposition rate was estimated at 78 mm year−1 leading to a rise in the channel bed elevation of 31 cm in four years. The fine-grained sediment mainly originated from the river with banks contributing 92 ± 6%, while forested and agricultural areas had negligible impacts. However, the sediment was coarse with the fine fraction accounting for only 7 ± 2% of the total mass. The low flows could explain the rapid deposition of large amounts of coarse sediment. While the sediment particle size composition was fairly homogeneous in this layer, the organic contribution (average 5.1 ± 2.4%) appeared to be much more variable with three main peaks, with the highest (~ 12% during the peak at 62-cm depth) being the maximum value measured in the core (Fig. 6c). This variation could result from the seasonality in aquatic vegetation both on the floodplain and in the river corridor. Indeed, the limited amount of cold water coming from the uppermost parts of the basin and the lower water depth may have led to higher water temperatures during summers, therefore increasing the biomass and the organic content of the sediment. The third period included the layers from 37 to 13 cm and covered approximately 30 years from the end of the reservoir filling (~ 1956) to the mid-1980s. The precise end of this third period could not be determined because changes in water management policy occurred at this time and the entire decade may have been a transition phase in the sediment dynamics of the river. During this third period, the floodplain deposition rate decreased to an average of 8.8 mm year−1. In these layers, the average content of organic matter was 4.3 ± 1.1% and the proportion of fine sediment increased to 41 ± 12%. The contributions of sources also changed and forested and agricultural sources accounted for 24 ± 11% and 6 ± 3%, respectively, while bank supply decreased to 70 ± 14% (Fig. 6). From 1957 to the early 1970s, the contribution of surface sources (forested and agricultural areas) was 40 ± 14% (32% and 8%, respectively). These contributions are strongly related to the annual discharge (Spearman correlation test: p < 0.001). McAdam et al. (2005) reported that floods during the 1957 to 1970 period were mainly due to abundant freshets, which might explain the rise in sediment supply from forested and agricultural lands. However, freshets alone cannot explain the changes in the source contributions. As an example, the massive freshet of 1976, with peaks flows of 745 m3 s−1 at Vanderhoof, had little effect on the apportionment of sediment from forested and agricultural areas. To understand these changes, one must take into account the massive supplies of channel bank sediment that occurred in the uppermost part of the watershed in 1961 and 1972 when the large amounts of water released at the Skins Lake spillway led to a bypass of Cheslatta Falls (Fig. 1), with the Cheslatta River carving out a new path to the Nechako River. The sediment mobilized during these two events amounted to ~ 1 × 106 m3 (McAdam et al. 2005). These drastic modifications in the sediment balance of the Nechako River significantly changed the source signature for many years. Thus, the first event at Cheslatta Falls had a visible impact on the source contribution at Vanderhoof during the first two years (1961 and 1962) and during the two following major floods in 1964 and 1967 when the discharge reached > 550 m3 s−1. These two years also matched the timing of sturgeon recruitment failure. McAdam et al. (2005) suggested that the coarser fraction of the sediment derived from the erosion of the Cheslatta alluvium reached Vanderhoof in 1972. This hypothesis is supported by our results that show a sharp increase in the contribution of channel banks to sediment deposited at the floodplain site just upstream of Vanderhoof that remained at a high level for several years (Fig. 6e). These results show that the sources, and thus composition, of sediment can be changed for long periods of time following major disturbance events such as landslides or, as in this situation, the massive erosion of stored alluvial sediment due to channel bank (and bed) erosion. The last period included layers from 12 cm up to the top of the core and covered approximately 28 years from the mid-1980s to 2014 when the core was collected. The average sediment deposition rate for this period was 4.3 mm year−1. This period is characterized by a rise in the proportion of fine sediment starting in the late 1980s (Mann-Kendall test: p < 0.01). This change could be related to the implementation of new water management policies that started in 1981. These policies imposed a minimum water discharge downstream of the dam and a regulated discharge in order to maintain the water temperature below a 20 °C threshold level so as to protect aquatic biota, especially salmonids and the Nechako white sturgeon (Hartman 1996). These changes in water management resulted in modification of the annual hydrographs with more water being released during summer, from 20th July to 20th August each year. The new water policies could have changed the source and composition of the sediment recorded in the core. Since ~ 1990, both the organic matter content and proportion of fine sediment have been significantly higher (Mann-Whitney test: p < 0.01) than those during the previous period (1972–1987). This could be related to the increase in cleared areas in the NRB from ~ 500 km2 in the 1980s to 1290 km2 in the 2000s (BCFLNRORD 2018b). However, the contribution of sediment from forests in the past few years remained lower than during the years following the completion of the dam suggesting that the rise in forested and agricultural lands might be compensated by the large supply of channel bank sediment from the Cheslatta Falls area. Overall, a strong relationship was found between the proportion of fine sediment and the contribution of forested and agricultural sources (Spearman correlation test: p < 0.001). This result suggests that surface erosion may lead to the supply of finer sediment to the river system, therefore changing the particle size of the sediment load. Consequently, the potential for channel bed clogging by fine-grained sediment, in addition to sands, might be related to the documented mortality of the Nechako white sturgeon (Hartman 1996) as the juveniles mainly feed on larvae for which the channel bed constitutes the main habitat (McAdam et al. 2005). Over the 2015 sampling period, the changes in the water discharge of the Nechako River and the supply of sediment from the main tributaries were found to be the main factors driving the variations in the origin of the suspended sediment load. Thus, the results for 2015 were strongly impacted by the management of the water release from the Nechako Reservoir via the Skins Lake spillway. However, changes in sediment sources at tributary sampling sites mainly depended on the timing and magnitude of snowmelt from the various parts of the basin. Regarding the time-averaged source contributions over the 2015 field season, the uppermost site on the Nechako River was unusual and results suggest that the large amounts of water released at the Skins Lake spillway were enough to remobilize bottom sediment from Cheslatta Lake and led to a higher forest source signature in downstream sediment. This geochemical signature could be related to the significant wildfire that occurred in the Cheslatta sub-basin during summer 2010, which may have caused sediment to be eroded from the hillslopes and be temporarily stored in the lake; however, further research is required to confirm this. For downstream Nechako River main stem sites, the main source of sediment was found to be the channel banks especially at sites located downstream of active cut banks or areas of the floodplain undergoing erosion. However, noticeable supplies from tributaries were observed; for example, the Nautley River contributed enough to the sediment load to change the composition at downstream Nechako main stem sites. At downstream sites, an increase of the proportion of sediment coming from forested and agricultural lands was observed, which was consistent with the rise in the surface areas cleared for forest harvesting and agriculture. The contribution from agricultural areas also depended on the steepness of the basin with steeper slopes leading to higher erosion rates. However, not all variations in sediment sources could be easily explained through land use and landscape morphology; clearly, more detailed spatial information is required to better understand the sediment dynamics. The use of biomarkers and land use–specific properties (e.g., organopollutants) as sediment fingerprints (e.g., Reiffarth et al. 2016; Owens et al. 2019) could provide useful insight to improve the understanding of the dynamics of sediment erosion and transport within the NRB. Regarding the historical results obtained from the sediment core, the completion of the Kenney Dam in the 1950s led to a drastic change in the sediment transport capacity of the Nechako River. Another significant temporal trend was the increase in the proportion of fine sediment measured in the most recent core layers. This change in sediment particle size was related to surface erosion and the contribution of forested and agricultural areas, which may have resulted in the clogging of river channel gravels. Consequently, this could explain the high mortality of white sturgeon juveniles as channel bed interstitial spaces constitute their prey’s main habitats. If this assumption is correct, any recent or future increase in cleared areas resulting in an increase in fine-grained sediment supply to the channel network may put the white sturgeon population at further risk. After the completion of the dam, a shift in the proportion of sediment originating from forested and agricultural lands was observed due to the increase of cleared areas in the NRB. This was counterbalanced by the large supplies of sediment derived from the erosion of alluvial sources such as channel banks from Cheslatta Falls in 1961 and 1972, which has remained high since. This study has used the sediment fingerprinting technique to demonstrate the complex response of river sediment dynamics over decadal timescales to multiple pressures associated with river regulation and land-use changes, in addition to episodes of wildfire and forest harvesting following mountain pine beetle outbreaks. Over annual timescales, temporal and spatial variations in sources are also driven by the location and timing of snowmelt. Future work in this basin will investigate additional years and utilize other fingerprinting properties to focus on specific river management and land-use activities, thereby helping to understand the role of cumulative effects in this “aquatic critical zone” (Bianchi and Morrison 2018). DG would like to acknowledge financial support from the French Academy of Sciences. Thanks are extended to Leticia Gaspar and Kristen Kieta (UNBC) and Emeline Herlet for assistance with the fieldwork; Erwin Rehl and Charles Bradshaw (NALS-UNBC) and David Lobb and Eva Slavicek (University of Manitoba) for laboratory support; Aseem Sharma for assistance with the climate data; and Wayne Salewski, June and Dennis Wood, and the Nechako White Sturgeon Conservation Centre for logistical support. Financial support was provided by Nechako Environmental Enhancement Fund (NEEF) and BC Real Estate Foundation Partnering Fund grants.